This guide is here to teach you how to slay in the Evolution of Combat, it will go over several combat tricks to help you understand why decisions are made and why certain methods are used. It is very like slaying in the old combat system, its just that little bit more complex. Section 5: Should I Dungeoneer? Try and have access to tier 50 equipment and abilities, this simply means having level 50 in Magic, Ranged, Defence, Strength, Attack and Constitution. Prayer is no longer a complete necessity in this combat system, having higher prayer is nice and you should aim to unlock Piety, Rigour and Augury. In the long run aim to unlock the higher level Curses as well, but none of this is necessary to slay. Have the mindset of training Dungeoneering and Herblore, both are extremely useful skills for Slayer in the long run, unlocking the Chaotic Maul and various potions. Do the Priest in Peril quest, this allows you access to the dark town of Canifis, in this town you unlock a new Slayer master and a whole bunch of new quests which will be helpful to you. Now that you have all this it's time to get started, if this section has given you everything you need go straight to Section 4 to get started with your first task. Armour Rating is not that important unless you are going to be attacking multiple enemies at once and expecting a high number of accurate attacks. Each monster has a weakness to a certain type of attack, like Crossbow Bolts or Stabbing weapons. Armour now works in tiers accessed by your Defence level (or in a combination of defence and another skill), these tiers are how you decide what armour you should be using (if you can afford that tier). Prayer is nowhere near as good as it once was and as such do not worry about Prayer bonus unless you can get the armour in the tier you want with prayer bonus as well. It's recommended to always use the highest tier boots and gloves you own. 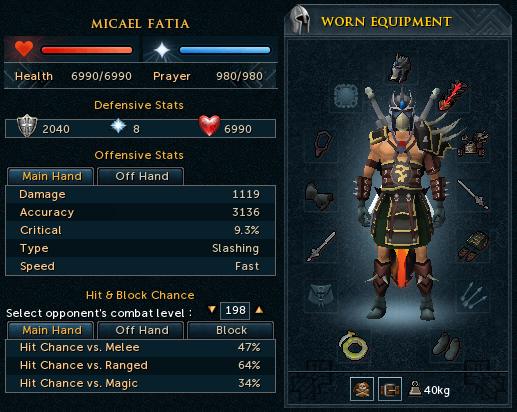 The combat style of the boots or gloves does not have to match the combat style you are using. An exception to this rule would be in tasks that require prayer. For example, Dragon Rider gloves and boots, which are not as good as tier 85 (Statics and Ragefires for example) or tier 75 (Ganodermic) gloves and boots but offer Prayer bonus, making them useful in certain tasks. Ghosts Ahoy - Unlocks the very useful Ectophial and also gives the start to some useful quests. The Grand Tree - Unlocks the use of Gliders which are handy when doing clues gathered from tasks. Dwarf Cannon - The cannon makes a lot of tasks go a lot quicker and allows you to get the fastest Slayer experience possibly obtainable in the game. Fairy Tale Part 2: Cure a Queen - Unlocks the use of the Fairy Rings which are very useful for quick access to a variety of areas. Shilo Village - Unlocks a future Slayer master, Duradel. Smoking Kills - Unlocks the Slayer master, Sumona and the reward system for Slayer. Ernest the Chicken - Gives access to Killerwatts. Cabin Fever - Gives access to Cave Horrors. Horror From the Deep - Gives access to the almighty Dagganoths. Slug Menace - Gives access to Proselyte Armour which has a high Prayer bonus. Along with equipment Herblore should be increasing gradually as well. You don't need to have extreme potions by this point, but it is recommended investing some of your rewards from Slayer into this skill. Herblore is extremely important in the late game and can drastically increase the speed at which you slay for a small increase in price. Some of the potions you can look forward to are the Extreme level boosting potions or the excellent Super-Antifire potion (acts as full protection against Dragonfire). After the release of the Smoking Kills quest slayers had to discover and understand a new feature added to the skill alongside a new master. The new feature was dubbed Slayer Rewards and it offered bonus to the slayers, who after completing the quest, managed to stay on route and not skip any of their tasks via Turael. These bonus came in the form of points from each of the masters above Turael; Mazchna, Vannaka, Chaeldar, Sumona, Duradel and Kuradal offer 1, 4, 10, 12, 15 and 18 points respectively for completing a task from them. However you will not start receiving points until you have completed at least 5 tasks in a row, none of which can be assigned by Turael. Cancel Task - Allows you to cancel your current task and get a new assignment without losing your current chain of tasks. Never Assign - Cancels your current tasks and adds it to a list of 5 possible tasks(1 for every 50 Quest Points capping at 250 Quest Points) that can never be assigned again. You may cancel the blocking of a task with the X but you will not be refunded any of the points you spent. The Slayer Helmet is a very useful item when it comes to Slayer, it has already been explained what it is comprised off but to really understand how good it is you need to know that you never have to take it off whilst slaying. It works for every task and is useful for all of them! 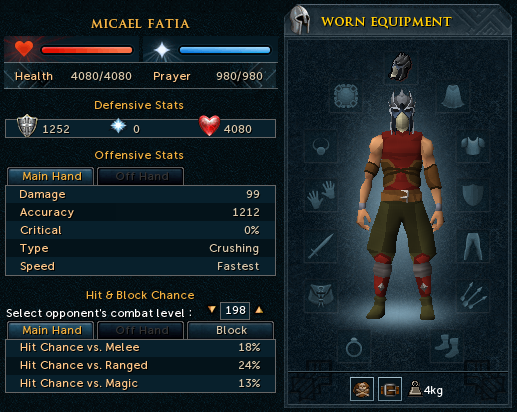 The Slayer Helmet has the same stats as a Rune Full Helm while giving no negative bonus to Ranged and Magic attack. Besides convenience, its greatest use is for those tasks where you would otherwise need special headgear (e.g. Dust Devils) because it provides the 15% accuracy and damage bonus of a Black Mask in addition to the protection of special headgear. In addition to this, the Ring acts as an Enchanted gem as well, it can be used to check how many more monsters you need to slay - THIS DOES NOT USE UP CHARGES. When 8 charges are used up, the Ring reverts to an Enchanted gem and can no longer be worn. Following the release of the Wyrm slayer monsters, two new items were released that allowed you to upgrade your Slayer Helmet. They are called the Hexcrest and Focus Sight, they are the black mask of Magic and Ranged respectively offering the same bonuses that the Black mask offers to melee. 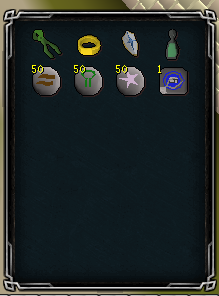 You can add these both to the Slayer Helmet giving a universal item that can be used on every slayer task. It doesn't offer any increased defensive stats but here is a picture so you can distinguish the two. There is a method that allows you to gain points rather quickly, simply all you have to do is to do your first 1-9 tasks from Mazchna and then the 10th (in a normal set of 10, 10th refers to the tasks that gives bonus points) get it assigned from the highest level Slayer master available to you so that you can reap the best amount of points from the bonus. This is a common method to gain the Slayer Helmet very fast. Social Slayer allows two people to join together to take on a task. You can invite someone to join you using your Slayer Ring or Enchanted Gem, however to do this you must both either have no current task or share the same task. 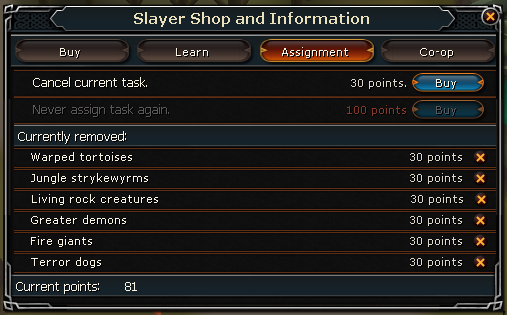 When in a Slayer Party the task can be completed by both players at once adding the kills of each to the total needed. Upon completion of a task each player will be awarded reward points in relation to the amount of monsters they killed, the amount of points rewarded will not exceed that of a solo task. Both players must be present for the remaining amount of kills to go down on their list; this means that one person can complete the task if their partner grows tired of slaying. You both do not need to be present when getting a new task but only the person requesting the task will have their task block list counted. 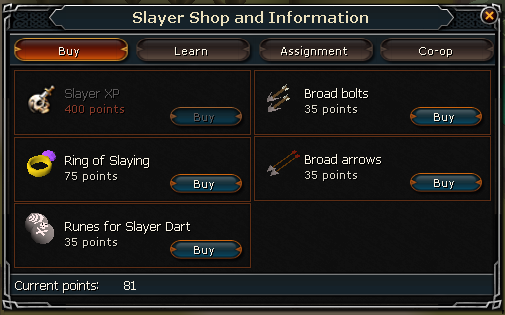 You will receive 1 co-op slayer point after completing a task to buy some rewards available at all Slayer Masters. There are 3 main ways in which Summoning can help you with Slayer: using Beasts of Burden, a Healing Familiars, or Attacking Familiars. I recommend reading the Summoning Help Guide for a better understanding of the summoning mechanics. Thorny Snail - Has 3 extra slots. 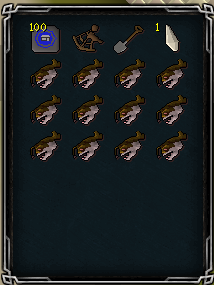 Spirit Kalphite - Has 6 extra slots. Bull Ants - Has 9 extra slots. Spirit Terrorbirds - Has 12 extra slots. War Tortoise - Has 18 extra slots. Pack Yaks - Has 30 extra slots. Bunyips are a peculiar familiar and when they are combined with high defence armour they can provide all of the healing you need per task. The bunyip will heal you 136 lifepoints every 15 seconds which is a passive effect. Their special ability is also useful on a few tasks, mostly waterfiends and aquanites which both drop raw fish. The special allows you to eat one raw fish at the cost of a scroll. You can also use a Unicorn Stallion which heals you 10% of your total health if you use a Healing Aura scroll. 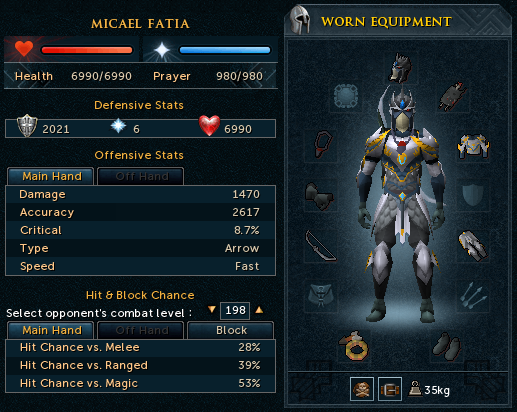 Steel Minotaurs - Fights at 90 combat and gives defence experience. Requires 56 summoning. Spirit Graahk - Fights at 93 combat and gives strength experience. Requires 57 summoning. Spirit Kyatt - Fights at 93 combat and gives attack experience. Requires 57 summoning. Spirit Larupia - Fights at 93 combat and gives controlled experience. Requires 57 summoning. Karamthulhu Overlord - Fights at 95 combat and gives ranged experience. Requires 58 summoning. Smoke Devil - Fights at 101 combat and gives magic experience. Requires 61 summoning. Abyssal Lurker - Fights at 93 combat and gives controlled experience. Requires 62 summoning. Spirit Cobra - Fights at 105 combat and gives attack experience. Requires 63 summoning. Stranger Plant - Fights at 107 combat and gives controlled experience. Requires 64 summoning. Mithril Minotaur - Fights at 112 combat and gives defence experience. Requires 66 summoning. Barker Toad - Fights at 112 combat and gives strength experience. Requires 66 summoning. Ravenous Locust - Fights at 120 combat and gives attack experience. Requires 70 summoning. Arctic Bear - Fights at 122 combat and gives controlled experience. Requires 71 summoning. Obsidian Golem - Fights at 126 combat and gives strength experience. Requires 73 summoning. Granite Lobster - Fights at 129 combat and gives defence experience. Requires 74 summoning. Praying Mantis - Fights at 131 combat and gives attack experience. Requires 76 summoning. Adamant Minotaur - Fights at 133 combat and gives defence experience. Requires 76 summoning. Forge Regent - Fights at 133 combat and gives ranged experience. Requires 76 summoning. Talon Beast - Fights at 135 combat and gives strength experience. Requires 77 summoning. Giant Ent - Fights at 137 combat and gives controlled experience. Requires 78 summoning. Fire Titan - Fights at 139 combat and gives magic experience. Requires 79 summoning. Ice Titan - Fights at 139 combat and gives attack experience. Requires 79 summoning. Moss Titan - Fights at 139 combat and gives strength experience. Requires 79 summoning. Hydra - Fights at 141 combat and gives ranged experience. Requires 80 summoning. Spirit Dagannoth - Fights at 148 combat and gives controlled experience. Requires 83 summoning. Lava Titan - Fights at 148 combat and gives strength experience. Requires 83 summoning. Swamp Titan - Fights at 152 combat and gives attack experience. Requires 85 summoning. Rune Minotaur - Fights at 154 combat and gives defence experience. Requires 86 summoning. Geyser Titan - Fights at 200 combat and gives ranged experience. Requires 89 summoning. Wolpertinger - Fights at 210 combat and gives magic experience. Requires 92 summoning. Abyssal Titan - Fights at 215 combat and gives attack experience. Requires 93 summoning. Iron Titan - Fights at 210 combat and gives defence experience. Requires 95 summoning. Steel Titan - Fights at 230 combat and gives ranged experience. Requires 99 summoning. 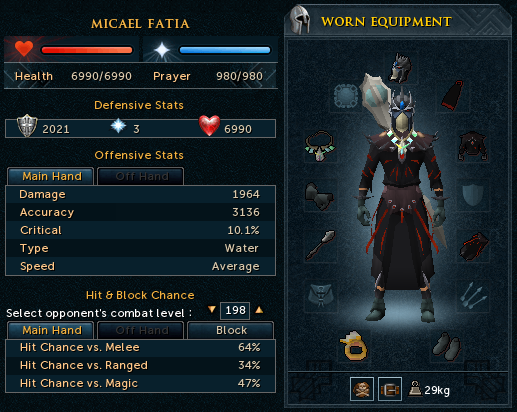 The skill Dungeoneering is very useful for Slayer, it has many rewards ranging from Resource Dungeons to new weapons. This section is all about explaining which of the rewards you can use for Slayer and why you should do some 'Dung' to make your slaying easier. 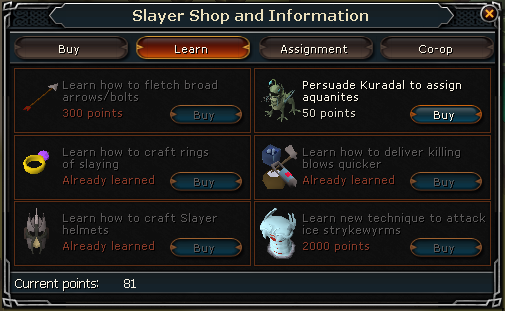 Please note: You don't need any of these rewards to slay, Slayer was out long before this skill was even in concept; these are just means to get a little more out of the skill. Karamja Volcano: This requires 25 Dungeoneering and gives access to 14 Lesser Demons. Baxtorian Waterfalls: This requires 35 Dungeoneering and gives access to 11 Fire Giants. Taverly Dungeon(Hellhounds): This requires 55 Dungeoneering and gives access to 12 Hellhounds, these are in Multi-Combat. Taverly Dungeon(Blue Dragons): This requires 60 Dungeoneering and gives access to 8 Blue Dragons. Chaos Tunnels: This requires 70 Dungeoneering and gives access to 8 Black Demons. Brimhaven Dungeon: This requires 80 Dungeoneering and gives access to Iron and Steel Dragons. Gem Bag: The Gem Bag costs 2000 tokens and all it does is let you add up to 100 Uncut gems (Sapphire, Emerald, Ruby and Diamond only) so that it doesn't take up and inventory space. Bone Crusher: The Bonecrusher (34000 tokens) isn't necessary at all, but it does do a very monotonous task for you. It buries all the bones that monsters drop for you and you get 100% of the experience, not advisable on Dragon tasks as their bones are quite valuable. Herbicide: Like the Bonecrusher, Herbicide (34000 tokens) isn't necessary but offers some welcome extra Herblore experience for you. Finally you should aim to get Chaotic weapons, they are some of the best available weapons in the game and should help you on your slayer tasks. All the Chaotic weapons are Tier 80 weapons. This section is all about what to do after your task and before you get a new one, you're probably thinking "Why don't I just get a new task straight away!? This is such a waste of experience!" Well you may be right, but surely you want to make a good chunk of extra profit every day for doing very little work? And maybe you want to do that clue you got on your last task, well this is a short and sweet section teaching you how to make best use of your time while doing this. Lets talk about doing Farming while you slay next! 4 Lower price seeds (Not in picture) - Pick a low value seed with decent value herb returns, you can work this out by comparing prices on the Grand Exchange. 1 Higher price seed (Not in picture) - This is your expensive seed, with higher payouts, to be used on the disease free patch that came from My Arms Big Adventure. If you haven't done this quest, don't bring this seed. Magic Secateurs - These are obtained from the Fairy Tale Part 1 and increase your yield by 10%. Explorer's Ring - Obtained from completing the Lumbridge Tasks and gives you unlimited teleports to the Falador farming spot. Ectophial - Obtained from the quest Ghost's Ahoy and gives you unlimited teleports to the a spot near the Canifis farming spot. Falador Shield 3 - Obtained from the Falador Tasks, it is not necessary at all and just offers bonus experience when harvesting from the Falador farming spot. Runes - These allow you to cast Fertile soil, which just adds Supercompost to your patch (if you can't cast this spell, bring 5 buckets of supercompost). Trollheim Teletab - This is obtained from the quest Love Story and is just the Trollheim Teleport (obtained from Eadgar's Ruse) for quicker transport to the disease free patch. Teleport using your explorers ring and run north, harvest the patch and replant. Teleport to Trollheim and run west into the troll cave, run south towards a door then go through it. Then run north up the ladder and north once again. Harvest the patch and replant. Teleport using your Ectophial, run west harvest the patch and replant. Lodestone teleport to Ardougne, run north, then east and harvest the patch and replant. Lodestone teleport to Catherby and you will be very close to the patches, harvest and replant them. 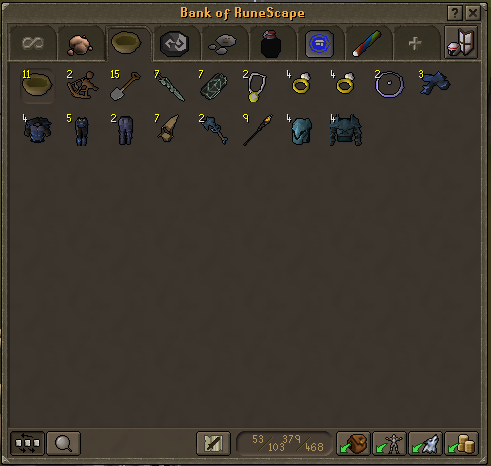 Now to make sure you don't have to bank during all of this, if you clean the herb after you harvest them, you can use them on the Tool Leprechaun and he will conveniently note them for you. You can do other farming jobs in between tasks but that's up to you! In this section there will be 3 sample ability bars, 1 for each of the different combat types. You do not need to follow these to the wire, these are just here as an example so that you get the general idea of how ability bars should be laid out. There will also be a brief section on the Dwarf Multi Cannon and how it can help you. The Dwarf Multicannon is a unique weapon. It is a weapon that you set up on the ground and load with cannonballs that deals damage on top of your normal weapon. If you bring this item and set it up in an area (that allows its setup) it can drastically increase the experience you receive per hour. However be warned that it will attack all enemies it can and as such they will attack you so be aware of your health. In the Evolution of Combat every monster has been given a specific weakness and it is important that before you decide to go out and do an assignment you check what the monster is weak to and what style you should use. The armour set-ups earlier in the guide were examples of what to wear for each of the unique styles with lists of weapons underneath that follow that style. For Magic based weaknesses sometimes it is better to always just use your highest damaging spell and let your abilities do all the damage as abilities damage are based off the hit of your auto attack which rises with the level of spell you use. From certain masters you can be assigned a Special task, these are unique compared to the other tasks and offer increased experience rewards and most of the time bonus reward points. Turael/Spria - You will be asked to go into the basement and in one trip slay one of all the monsters inside. Upon completion of this you will be awarded 1000 Slayer experience. Mazchna - You will be asked to investigate certain Fairy Rings (CKS, ALQ and BKR) whilst there you activate your slayer gem and a monster will appear that you have to slay. Upon completion of this you will be awarded 2000 Slayer experience and 3 reward points. Vannaka - You will be asked to go slay one of each of the Chromatic Dragons and get a perfect scale from each of them (Green, Blue, Red and Black). The drop is not guaranteed so you may have to kill a few. Upon completion of this you will be awarded 4000 Slayer experience and 10 reward points. Chaeldar - You will be asked to use a new experimental fungicide on the Mutated Zygomites(10 in total) instead of the normal type. The experimental spray can kill them like normal, enrage them (health partially healed and attack rate increased) or fully heal the monster. Upon completion of this you will be awarded 10000 Slayer experience and 10 reward points. Sumona - You will be asked to slay the Kalphite Queen, you may bring help but you have to deal the majority of the damage. Upon completion of this you will be awarded 15000 Slayer experience and 15 reward points. Duradel/Lapalok - You will be asked to travel to the Slayer tower and kill 21 Crawling Hands, 8 Banshees, 9 Infernal Mages, 7 Bloodvelds, 7 Aberrant Spectres, 5 Gargoyles, 6 Nechryaels and 6 Abyssal Demons without leaving the tower. Upon completion of this you will be awarded 20000 Slayer experience and 35 reward points. Kuradal - You will be asked to complete the Fight caves, you may die and come in and kill some extra monsters to finish the task in case you can't take down the Jad. Upon completion of this you will be awarded 25000 Slayer experience.